 The film's theater run in Tokyo was extended, twice. It was originally only going to run from Nov. 20th to Dec. 24th, but was extended to Jan. 14th because of overwhelming fan response. They later held over the film again until the end of January. On the night of its premiere, the film broke Japan's Cinemarise Theatres' audience attendance records. The Skinny: From Makoto Shinkai, the indie writer/director behind Voices of a Distant Star, comes his first feature-length studio work, a beautifully animated film centering on three friends and the promise they made to each other in their youth. Essentially a tender romance story intermingled with realistically played sci-fi, The Place Promised in Our Early Days is a stunning work - although perhaps a bit too abrupt and opaque for its own good. 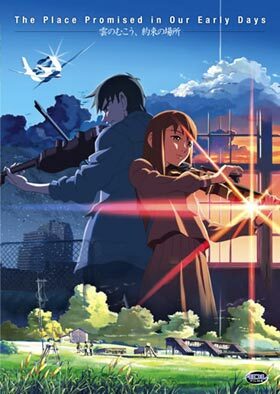 Even so, Makoto Shinkai looks to be a filmmaker on the rise. Makoto Shinkai, touted by some as the next Hayao Miyazaki, follows up his acclaimed short film Voices of a Distant Star with the 2004 animated movie The Place Promised in Our Early Days. Part love story, part sci-fi opus, the picture details the relationship between three teenagers, and how the pact they made in the past comes to have consequences for all their futures, and perhaps even Japan's. The story takes place in an alternate timeline in which Japan was split in two after the Second World War. While the Southern Alliance works hand-in-hand with the United States, the Northern Union is far more enigmatic. The Union constructs a gigantic tower that stretches so far into the heavens that it can be seen for miles. Its purpose, however, remains a mystery. Amidst this tense border conflict, two young boys, Hiroki Fujisawa and Takuya Shirakawa decide to build a plane so they breeze past the tower. While at school, the two make friends with Sayuri Sawatari, a cute girl whose youthful exuberance only serves to inspire the boys even more to complete their project. As the three youngsters bond, the boys promise to bring Sayuri along with them whenever the plane is ready for takeoff. But things take a sharp turn when Sayuri suddenly disappears. Disheartened by her abrupt absence, the boys eventually lose interest and abandon their bold idea altogether. Even worse, the two boys begin to drift apart. Takuya becomes a scientist investigating the truth behind the Union Tower: apparently, it's actually a kind of gateway to parallel dimensions. As the fog of war between the north and south looms heavily over the proceedings, Takuya joins up with a terrorist faction looking to take down the Tower, which they view as the WMD to end all WMDs. Meanwhile, Hiroki finds himself haunted by nightmares that show Sayuri trapped in a dream world, frightened and alone. Believing he is the only one who can help her, Hiroki returns to the workshop he and Takuya shared as teenagers. Hiroki believes Sayuri's fate is somehow tied to the mysterious tower and succeeds in making contact with her in the dream world. When Sayuri's true whereabouts are made clear, Hiroki does everything in his power to honor the promise he made to her years ago. However, there's one person standing in Hiroki's way: his former best friend, Takuya. Will the promise be fulfilled or has the friendship wholly disintegrated? From start to finish, The Place Promised in Our Early Days is not your typical science fiction film. Quiet and introspective, the movie plays out like a coming-of-age romance, one that contrasts the sunny idealism of youth against the cold hard facts of adulthood. And with its emphasis on flashback and voiceover, the movie often feels like a dreamy, yet somehow realistic novel. Parallel universes, civil war, and technological marvels just happen to populate the world of The Place Promised in Our Early Days, but they aren't the focus. Certainly, the sci-fi element figures strongly into the film, but it is weaved into the narrative in such a believable, often unobtrusive manner that one can see how this sort of story could succeed even without the sci-fi trappings. If there are any complaints that could be laid against the film, it would have to be in reference to its ending, which feels less triumphant than it does perfunctory and woefully abrupt. One could argue that the characters have reached the end of their arcs, and thus, there's nothing more to tell, but in this case, the opaqueness of the finale makes it seem like the filmmakers figured they'd go for open-endedness rather than actually craft a truly satisfying resolution. The ending serves its purpose and doesn't detract from the entirety of the film, but it would have been nice to have a conclusion that matched up with all that preceded it.